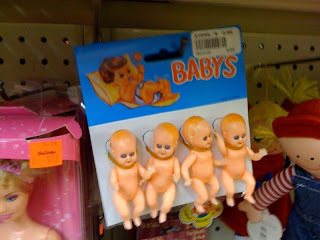 My good friend and dedicated Gallery scout, Janine, found this frightening item in a variety store in Arlington, VA. This is truly creepy. Looks like they're hanging the babies. And as if allusions to infanticide wasn't enough, they can't even spell correctly. Mama, don't let your babys grow up to be kitschy plastic dolls.